Reading and share top 69 famous quotes and sayings about Musicals by famous authors and people. Browse top 69 famous quotes and sayings about Musicals by most favorite authors. 1. "I did musicals from about age 10 to 18." 2. "What would Samuel Becket say if he knew that Broadway musicals are all that survived of the theatre world?" 3. "And, I'd never done Tennessee Williams, and I had done Broadway musicals, so it was a challenge." 4. "Corny answer is of course is that everyone who wants musicals are children in different ways, aren't they? So you think of them in different ways. There are things of mine I'm sorry haven't come here." 5. "At a very early age I knew I wanted to be an actor and then more specifically that I wanted to be on Broadway and be in musicals." 6. "We all sing about the things we're thinking; musicals are about expressing those emotions that you can't talk about. It works a real treat." 7. "The only genre I have any problem with is musicals, but that's just my own tastes it's nothing to do with the films." 8. "I went on a few auditions for Broadway musicals, and never stopped taking classes, but I didn't take it seriously until I was out of college." 9. "When I was 10, I knew there was something different about me. Everyone was football-mad, but I just wanted to watch musicals and see art." 10. "I was a big fan of John Cassavetes, his wife, Gena Rowlands, and that era of filmmaking which was about realism and which represented the antithesis of the dreamy escapism you found in musicals." 11. "I began my career performing in plays and musicals in New York, but by the mid-'80s, opportunities in Hollywood beckoned and I made the move to Los Angeles. It was a good decision. Work took off, but most important, I met my family out there - my husband, Bill, and the children we would adopt: Elijah, Mae-Mae, and Aron." 12. "I was the lead in two musicals, and I took dance classes." 13. "But I wish they would make a musical of some kind. I miss musicals so much. You don't see them anymore." 14. "I also loved musicals because I was a dancer." 15. "I will be singing primarily all the songs from the musicals that I have been in from over the years." 16. "Barbara Stanwyck, in particular, was peerless in everything from high and low comedy to drama to musicals to film noir. She never took a false step." 17. "We attach to most of our chapels a cultural hall so that our youth may have a place to dance, to perform their talents in musicals and other uplifting entertainment, and we hope our youth leaders as trustees of the building will see to it that only wholesome, uplifting activities are performed in this building. Should you have any reservations whether or not an activity, a style of dancing or tempo of music is in accord with Church standards, may I suggest this guide: Does it uplift and inspire one to higher ideals? Does it develop wholesome relationships between young men and women, or appeal to and arouse their baser instincts? Will it cause one to be a better Latter-day Saint and lead one closer to the Savior? Avoid all activities and dances which bring the world's demoralizing standards into this sacred meeting place." 18. "I love Gershwin. I love musicals." 19. "As a father of five, I sometimes feel I've spent a lifetime watching Disney musicals." 20. "Well, the musicals give emphasis to love, longing, melancholy, sadness. All of that is always there." 21. "I don't have that kind of voice, the big baritone or rousing tenor sound. My wheelhouse was in the frothier pieces. So my appreciation for those older musicals and revivals grew." 22. "In so many musicals today, the story is moved forward by a song. I don't think we're gonna try to do that." 23. "Acting on stage is still my favorite thing to do. And everyone who's been in musicals knows that there is nothing more fun." 24. "I love fantasy. I love horror. I love musicals. Whatever doesn't really happen in life is what I'm interested in. As a way of commenting on everything that does happen in life, because ultimately the only thing I'm really interested in is people." 25. "I have to go back to my younger days, when I just adored Hollywood musicals." 26. "There are wonderful museums with lots of photographs of 1920's musicals." 27. "Good," said Gideon. "It means the effect of the alcohol is wearing off. One question, by the way: what did you want a hairbrush for? ""I wanted it as a substitute for a mike," I murmured through my fingers. "Oh, my God! I'm so horrible. ""But you have a pretty voice," said Gideon. "Even I liked it, and I told you I hate musicals. ""Then how come you can play songs from them so well?" I put my hands in my lap and looked at him. "You were amazing! Is there anything you can't do?" Good heavens, I heard myself sounding like a groupie."No. Go ahead, you're welcome to think me some kind of god!" He was grinning now. "It's rather sweet of you!" 28. "Do I want to write a musical? No. I like to do musicals." 29. "I mean, I've done musicals, but it's not my best thing." 30. "I started in musicals. My first professional experience was Dorothy in 'The Wizard of Oz' in Palm Springs." 31. "I've been doing musicals since forever. 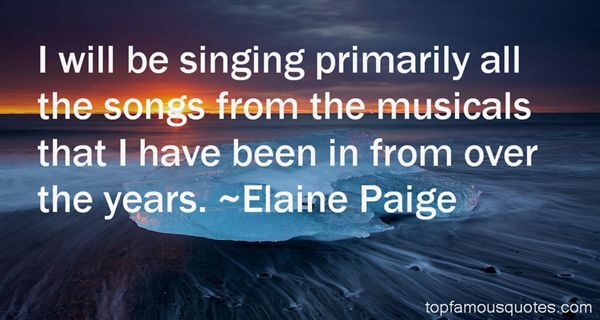 Actually, I was focused on singing and becoming a singer until I landed on 'Passions.'" 32. "I know, it's weird that I've never done a musical. I turned down two of them. 'The Lion King' and 'The Producers.' I turned two of the biggest Broadway musicals down, am I a mess?" 33. "I grew up on musicals, and I know they are quite the thing now, but I'm actually a little indignant, because I started taking singing lessons years ago - I put the time in!" 34. "Slightly forgettable movies can sometimes make great musicals." 35. "My view is that musicals are love stories with great final scenes. It's just that simple. Musicals are also conflicts between two worlds. 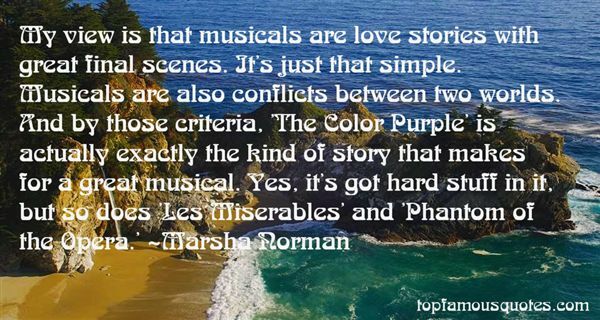 And by those criteria, 'The Color Purple' is actually exactly the kind of story that makes for a great musical. Yes, it's got hard stuff in it, but so does 'Les Miserables' and 'Phantom of the Opera.'" 36. "As a kid, I was really into performing. I would do choruses, I would do musicals, whatever it was. And then, as a teenager, I got into an acting class at SUNY Purchase for gifted kids, and that really turned me on to material beyond musicals, Sam Shepard, and Christopher Durang plays." 37. "I would love to be in musical theater and be on Broadway. If someone were to offer me a position to do something like that, I wouldnt pass it down. Im a huge fan of musicals and I really want to do that." 38. "I'm not gay, so I don't know much about Broadway musicals." 39. "Of course I've done musicals here in London." 40. "Broadway musicals, where you sing the whole time, I really don't like; I like alternating dialogue and music." 41. "Musicals are written and then rewritten. Those things used to happen on the road. Now they are done in New York during preview performances." 42. "Listen - I like musicals. Even when they're bad, there's a couple of dancers I can watch." 43. "I used to sing songs from musicals all the time as a kid." 44. "I don't think I've got the stuff that Broadway musicals are made of. But there are definitely many musicals that I enjoy. 'Hair' and 'Rent' might be my favorites." 45. "I loved old black and white movies, especially the Fred Astaire and Ginger Rogers musicals. I loved everything about them - the songs, the music, the romance and the spectacle. They were real class and I knew that I wanted to be in that world." 46. "You know, sound was still a fairly new thing when I came into movies. And the reason musicals happened is because of sound. They could put music in the picture! That's how it all began." 47. "I could sing in English before I could understand it because I phonetically learned it from the musicals." 48. "But I think musicals are going to have to deal with important subjects." 49. "I love Canada. I miss the heat of India, the food, the house lizards on the walls, the musicals on the silver screen, the cows wandering on the streets, the crows cawing, even the talk of cricket matches, but I love Canada. It's a country much too cold for good sense, inhabited by compassionate, intelligent people with bad hairdos." 50. "I tap danced for ten years before I began to understand people don't make musicals anymore. All I wanted to do was be at MGM working for Arthur Freed or Gene Kelly or Vincent Minelli. Historical and geographical constraints made this impossible. Slowly but surely the pen became mightier than the double pick-up time step with shuffle." Being in a hurry. Getting to the next thing without fully entering the thing in front of me. I cannot think of a single advantage I've ever gained from being in a hurry. But a thousand broken and missed things, tens of thousands, lie in the wake of all the rushing.... Through all that haste I thought I was making up time. It turns out I was throwing it away."